She stopped in the middle of the forest, straining to look at the shadows darting between the trees in the distance. The sweet reminder of summer fruit was dancing on her tongue. The light dimmed as the trees closed in, a dense canopy blocking the sun. From somewhere above, a pod fell and hit the ground with a dull thump. A single ray of light broke through the trees and illuminated the place where the pod fell. 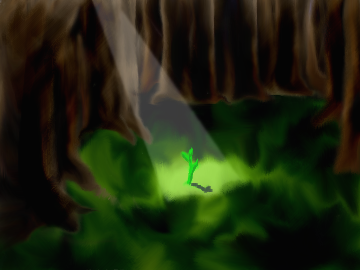 A plant sprouted forth from that place, so green in the ray of light that it hurt the eyes to look at it. She blinked away the tears as the plant grew. Its leaves rustled as the plant took form, the breeze carrying the hint of words. “I come,” the whisper said in her ear and she felt a quiver of excitement. Heena sat up and heard the heavy breathing in the darkness. She sensed the bodies around her, already moving. “What?” Heena said, looking around at the shadows moving around her. Was it still dream, or was she waking up? She felt a hand gently placed on her shoulder. Heena sat for a moment, pushing the haze of sleep out of her mind. Ree and the plant. Something she should know. Tama counted quietly to herself. “No… too soon…,” she said with concern. Tama stood up with Heena, but hesitated. She look at Heena in the dim light of the moon, then slowly turned to get everyone ready. Heena strode over toward the sound of heavy breathing. She went to the sitting shadow closest and leaned down toward it. “Wod?” she asked. The camp exploded with movement once the decision was made. The tribe gathered their items up as quickly as possible, although Skiro grumbled about being woken up in the middle of the night. In a few minutes everyone was ready. Wod and Tama supported Ree between them as they set off in the direction of the mountains. The tribe moved quickly to the trees Heena remembered. When they arrived, the tribe moved with a purpose to get ready. Ree was sat against a tree as Wod went to make a fire as instructed. Heena went through her pack and found some of the dried herbs she had in a satchel. When the small fire was built up, she put the herbs on to burn. The sweet smell quickly filled the immediate area. Heena went to where Ree was sitting against the tree. Everyone else had moved off, assumed their positions guarding the ceremony. Heena sat down next to Ree and took her hand and gave it a brief sqeeze. She matched Ree’s breathing, deeply inhaling and exhaling in time. Ree’s eyes fluttered open and she turned to look at Heena. “He comes,” Ree whispered. Uncertainty played across her face. A hint of a smile crossed Ree’s face, comforted by Heena’s voice, then she closed her eyes and concentrated. She clenched her jaw as the spasms started in force. Heena gripped her hand tightly in support. It wasn’t long before the green motes of light finally appeared. They were small and few at first, slowly accumulating around the tree that Ree was sitting against. Heena looked up and gasped in wonder; even the first motes were so bright at night. The motes grew larger and brighter and more numerous as the time passed. Ree’s breaths became deeper as the lights drifted downward, circling the tree. When most of the lights had settled near the base, they floated around Ree. Heena shifted into position to guide the birth. Heena heard Ree grunting and gasping, fully in the grip of labor. With a twitch, Heena saw the head come out. She stroked the wet head of the newborn, giving it the first sensations of life and encouragement to come out. As the time passed slowly and the motes danced around her, Ree continued to push and the baby continued to move outward. With a last, muffled groan, the baby was delivered to the world. The motes of light started to fade away. Heena heard them whisper a name, “Laen” as most of the light faded, leaving only a soft green glow mingling with the orange glow of the fire. Heena held the newborn in her arms. He looked around, bright eyes taking in the beauty of the motes still left. He reached a hand to clumsily grasp at a mote as it floated by. It was another few moments before Ree’s eyes opened. She took a deep breath and looked up at Heena. “A boy,” she said with fatigue clouding her voice. The mother held the baby to herself as the last of the motes faded away, leaving only the flickering fire and the moon to illuminate the area.